^ Landsea, Chris (13 July 2005). "Why doesn't the South Atlantic Ocean experience tropical cyclones?". Atlantic Oceanographic and Meteorlogical Laboratory. National Oceanographic and Atmospheric Administration. Retrieved 9 June 2018. ^ "OSHA's Hazard Exposure and Risk Assessment Matrix for Hurricane Response and Recovery Work: List of Activity Sheets". U.S. Occupational Safety and Health Administration. 2005. Retrieved 2018-09-25. ^ "Before You Begin – The Incident Command System (ICS)". American Industrial Hygiene Association. Retrieved 2018-09-26. ^ "Volunteer". National Voluntary Organizations Active in Disaster. Retrieved 2018-09-25. ^ a b c "Hurricane Key Messages for Employers, Workers and Volunteers". U.S. National Institute for Occupational Safety and Health. 2017. Retrieved 2018-09-24. ^ a b "Hazardous Materials and Conditions". American Industrial Hygiene Association. Retrieved 2018-09-26. ^ "Mold and Other Microbial Growth". American Industrial Hygiene Association. Retrieved 2018-09-26. ^ a b c "OSHA's Hazard Exposure and Risk Assessment Matrix for Hurricane Response and Recovery Work: Recommendations for General Hazards Commonly Encountered during Hurricane Response and Recovery Operations". U.S. Occupational Safety and Health Administration. 2005. Retrieved 2018-09-25. ^ "Electrical Hazards". American Industrial Hygiene Association. Retrieved 2018-09-26. 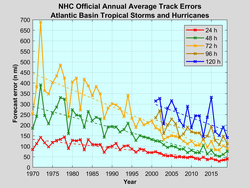 ^ Michael J. Brennan, National Hurricane Center (2017-07-03). "Automated Tropical Cyclone Forecast (ATCF) Data Files / Text Files". National Oceanic and Atmospheric Administration. Retrieved October 14, 2018. ^ "Tropical Cyclone Names". Met Office (United Kingdom Meteorological Office). Retrieved 17 October 2018. 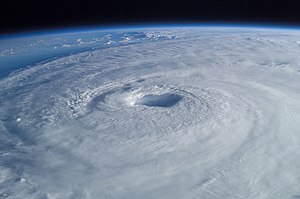 ^ "RSMC Tokyo - Typhoon Center". Japan Meteorological Agency. Retrieved 19 October 2018. ^ "過去の台風資料" (in Japanese). Japan Meteorological Agency. Retrieved 19 October 2018. 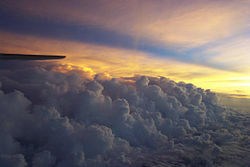 ^ "Rare Tropical Cyclone Forms Off Brazil". EarthWeek. Retrieved 18 October 2018. ^ "Observed and forecast tracks: southern hemisphere 2016-17". Met Office (United Kingdom Meteorological Office). Retrieved 17 October 2018.